On Monday we created a map illustrating the geography of virtual references to the words "football" and "soccer". In today's post, we've added eight more languages into the mix: German, Portuguese, Dutch, Spanish, Japanese, Korean, Thai and Chinese. 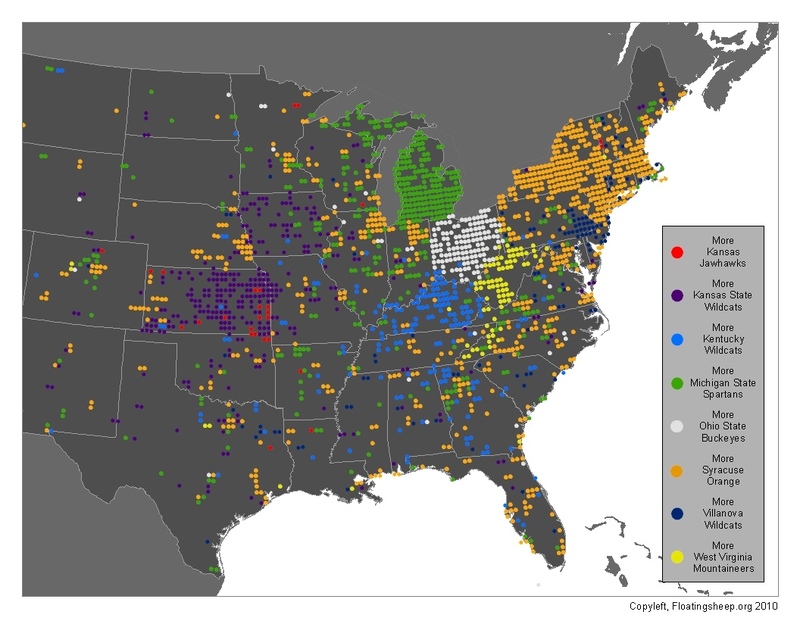 The map below visualizes which of these various ways of referring to "football" are most visible at any particular location in the Google Maps database. 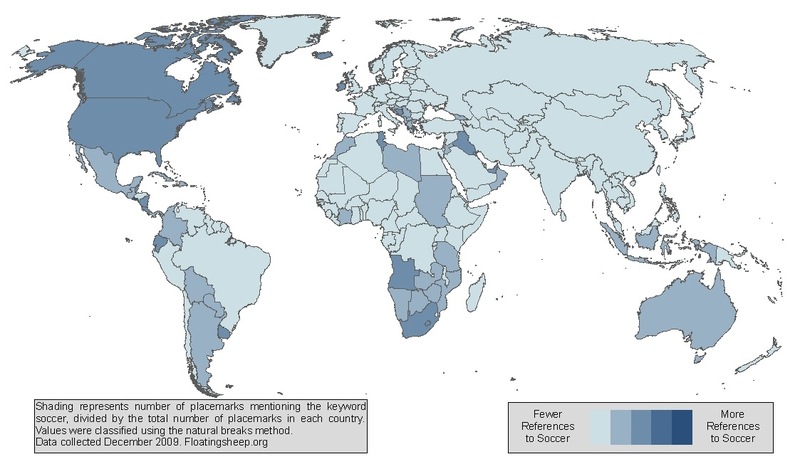 What struck us most was how the map reproduces expected patterns (based on language groups) with very few exceptions: most points in Korea reference the Korean word for football more than the same word in any other language. The same thing is true in Japan, Thailand, Brazil/Portugal and every other country associated with the languages that we conducted this batch of searches in. Ultimately, Australia wins the prize for having the most homogeneous footballing cyberscape. There is only one place in the country with a reference to football in a language other than English: A reference to Fussball (German) somewhere around the vicinity of Alpine National Park in Victoria. Perhaps there is some sort of odd colony of football playing Germans (is there any other kind?) in this National Park (would any Aussie readers mind checking up on this for us?). Sweden and Poland are interesting cases: a diverse mix of references to the sport in English (both "football" and "soccer"), German and Spanish, with a small smattering of Dutch and Portuguese. Of course, if we had searched in Swedish or Polish the results would likely have been otherwise. 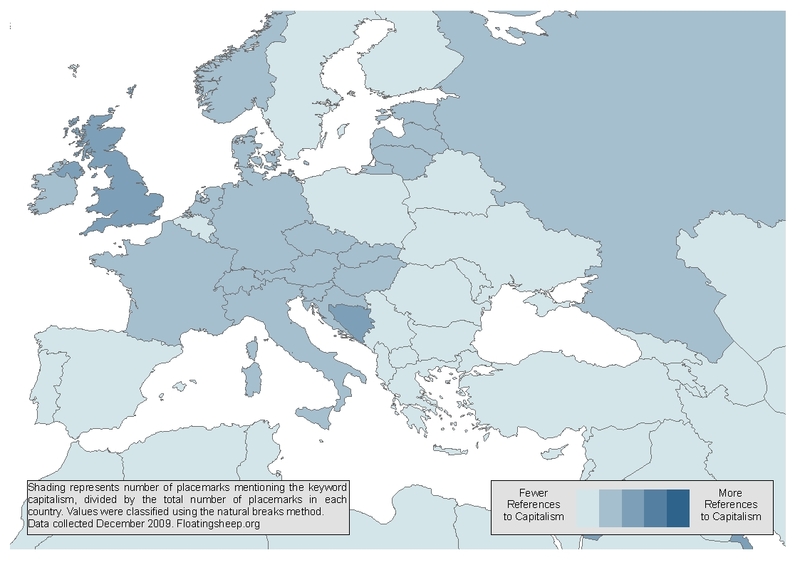 English appears to be the dominant language for references to the sport in most parts of the world with no direct connection to one of the languages in which we conducted the search (e.g. in Iran, Finland and Russia). We should also point out the the French word for football is "football," so it is difficult to distinguish between references made in English and French using this keyword. 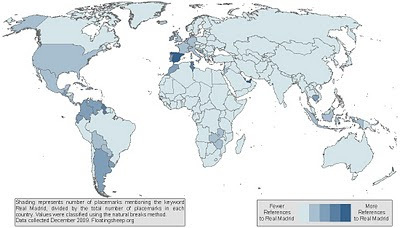 This map is about more than just a sport. 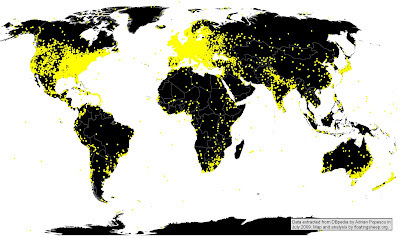 We are interested in using this method to study and map cyberscapes in a range of languages. 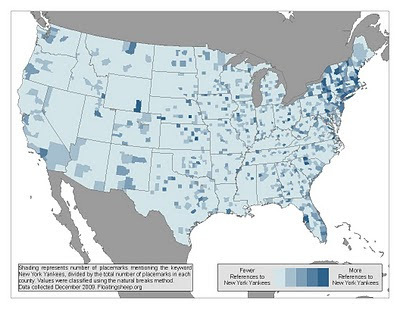 This map was just a first step to test some of the boundaries of the method. We will eventually be mapping a range of other terms in a lot more languages in the near future. Suggestions are welcome. p.s. This may be a dagger in the heart of many calcio loving Italians, but despite having won the World Cup four times we simply forgot to do a search in your language. Ci scusiamo. We don't know what we were thinking. We've decided to wade into an age-old debate. Should football/soccer be called football or soccer? Consulting Wikipedia doesn't really help, as there are twenty one pages of argument debating this very question (they finally settled on the term "association football"). In order to usefully respond to these debates, we figured that we should try to develop a useful understanding of the geography of "football" and "soccer." So our foray into this argument will be through a couple of simple maps. The first shows the relative usage of the word "football," while the second relative usage of the word "soccer." Some interesting patterns are evident on these maps. Much of Arabic and Anglopone Africa stands out with a large number of references to both terms (in fact, "football" and "soccer" are some of only a small number terms that we have thus far encountered that have a comparatively high number of hits in Africa). A quick sample of the hits for football and soccer in a few different African cities reveals a range of geographic associations with the terms: bars that show football, soccer pitches, conversations that were had about football, recorded memories of a soccer game that took place, and of course references to the forthcoming World Cup in South Africa. Yet it remains unclear why Libya, Sudan, Tanzania and many other countries on the continent score so highly. In some cases, a large number of hits for either "football" or "soccer" does seem to be correlated with on-the-pitch successes (either historical or contemporary): see Uruguay and Iraq as examples. Uzbekistan is another interesting example. Surprisingly, the country is home to a relatively large number of virtual references to "football," despite not really being the first country that springs to mind when thinking of the sport (a la Brazil, Germany or England). The country has a low total number of placemarks, but it is likely the relative prominence of FC Bunyodkor (an intriguing case of billionaires, politics, and sky high ambitions) that has sparked a lot of online interest in the footballing side of Uzbekistan. None of this really helps us resolve the football vs. soccer debate. So we made one final map illustrating the contrast in the number of references to both terms. What does this map tell us? There are only a few places in the world in which there are more references to soccer than football (Brazil, South Africa, parts of Japan and South Korea, and Canada). Interestingly, Ireland, the US and Australia all refer to association football as "soccer" and yet have far more references to "football." This is likely due to the fact that all three countries play their own regional versions of the sport: Gaelic football, American football, and Australian rules football. Stay tuned, as our next post will look at how linguistic differences in virtual references to football/soccer in Google Maps are reflective of the differences in language use in the offline world (or perhaps not?). Today we're offering a follow up to our earlier post on the mapping of Wikipedia biographies using some data from Adrian Popescu. the continued relative high level of entries within the Western world during the 20th and 21st centuries. The geographies of content presented in these maps reflect both the language bias within the data (limited to English) but also the uneven geographic focus of much historical scholarship. And it remains important to recognise that these uneven geographies likely play a key role in shaping our understandings of the word. Adrian Popescu, Gregory Grefenstette (2010) Spatiotemporal Mapping of Wikipedia Concepts, JDCL 2010, June 21-25, Brisbane, Australia. The floatingsheep collective managed to meet up in material space at the AAG conference this past week and took this photo to show off out spiffy new ties. As demonstrated by the image, some of us were happier about (and more skilled in the implementation) of the neck wear than others. Don't worry. We'll be posting more maps/analysis soon. 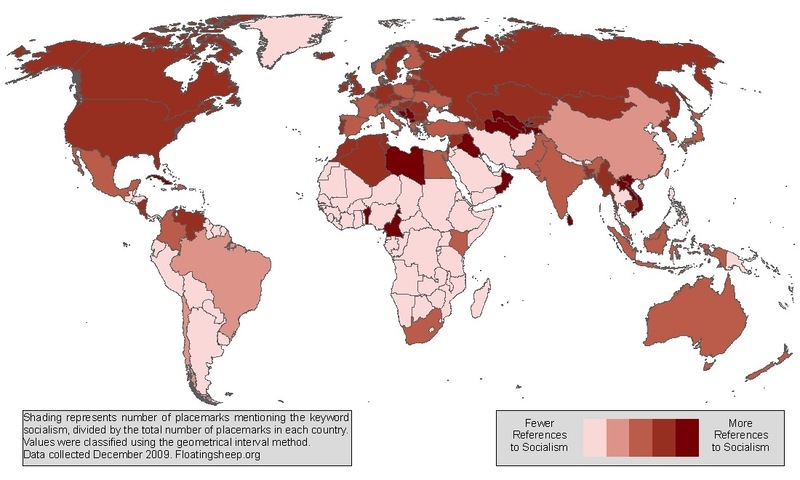 FloatingSheep has been award the HERO tag over fark.com for the great American pizza map. An honor that in recent memory has only been awarded to an independent-minded Catholic priest, Barney Frank, Scott Brown, and Stephen Colbert. Our apologies to everyone else for cheapening the tag -- except for Colbert unless he does the right thing and interviews us on the Colbert Report (Please? We'll comp you a beer belly of America stein)! 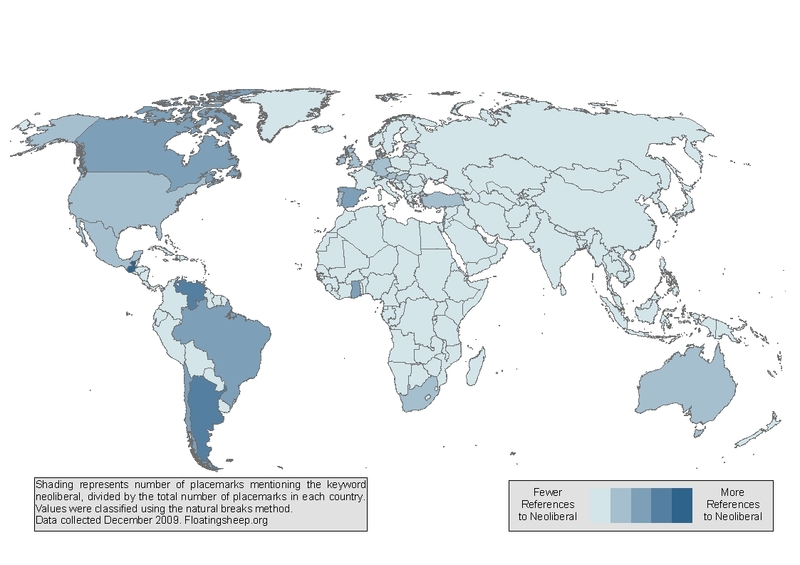 Following on from our last post on mapping Wikipedia biographies, here is a quick overview of biography articles visualised by country. Again, wiki bibliographies are intended to be entries about notable people, you can see more about this definition at our previous post. The US comes out on top of the list here, with more than half of all biography articles prominently mentioning the country or a location within the country. On the other and of the scale, there are about fifty countries and territories (examples include Bhutan, Gambia and the Maldives) which are prominently mentioned in fewer than ten biographies. It is also interesting to examine the data normalised by the populations of each country (see below). At the top of the list is the Vatican City. There are 242 articles in which the Vatican City is prominently mentioned for every 1000 people in the country. This isn't really that surprising given the tiny population of the country and the long list of famous people associated with the Vatican. 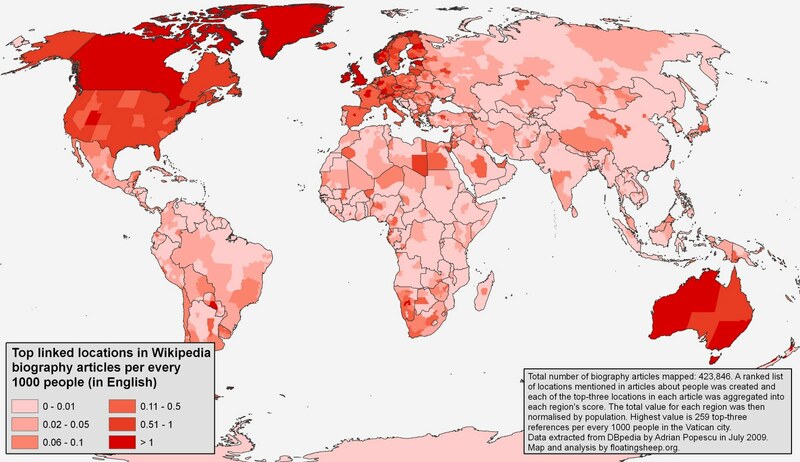 If we remove city-states and island nations from the list, we see that Iceland, Ireland and the UK have the most per capita mentions in Wikipedia biographies (all have roughly three articles in which the country is prominently mentioned per every 1000 people in each country). 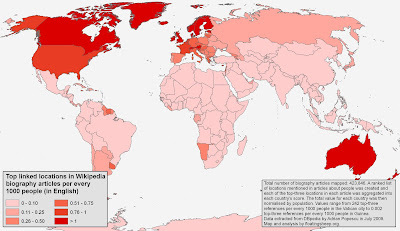 Also interesting is the fact that Australia, Canada and all of the Nordic countries also have very high numbers of Wikipedia articles mentioning those places per every 1000 people in those countries. At the other end of the list we have Guinea which has only two mentions in Wikipedia biographies per every one million people in the country (most African countries have similar per capita numbers). China also has an extremely low number of biography articles per capita - although this owes much to the enormous population of China rather than an low total number of mentions in Wikipedia biographies. These figures are likely skewed by the fact that we are measuring biographies of people from all centuries. This would seem to give higher numbers of articles to parts of the world with thousands of years of recorded history (e.g. the Vatican) rather than places with a smaller amount of recorded history (e.g. New Zealand). That being said, it is interesting that many of the countries in the "New World" (e.g. the US and Canada) are far better represented in Wikipedia than countries like Greece, Iran and Egypt which are home to some of the earliest recorded histories of humankind. 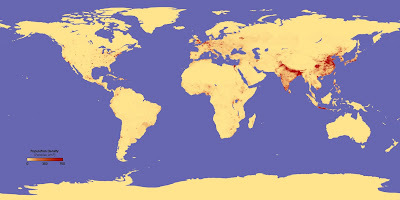 We nonetheless plan to post some more detailed versions of the maps by century in the near future. 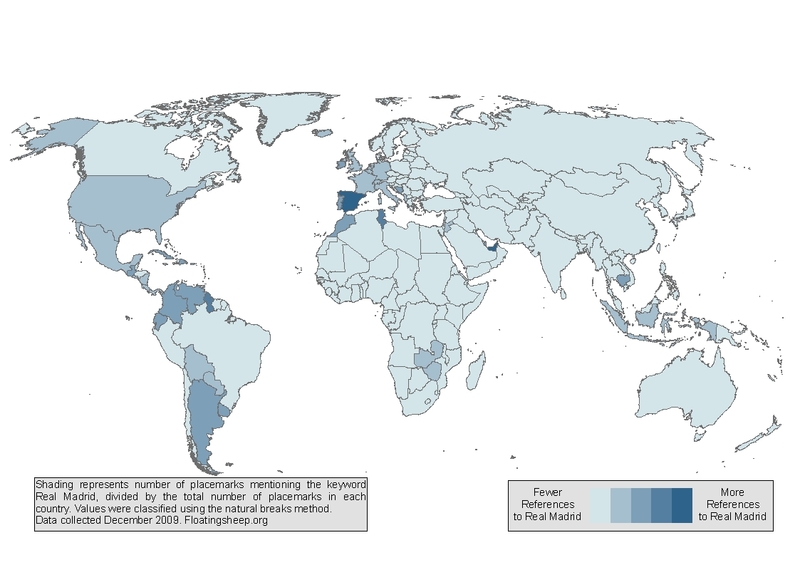 Our post on Mapping Wikipedia Biographies for the methodology that we used to create these maps. The data used to create these maps were collected by Adrian Popescu and are available here. The map below is a visualisation of references to places within 423,846 biography articles in the English version of Wikipedia. The definition of these bolded terms and the methodology used to obtain these data is discussed in more detail below. Now compare this map to the below map of actual population density. The differences are quite astonishing. What one sees is that articles about people in Wikipedia are highly likely to reference particular parts of the world (the US and Western Europe). This is a geography of people that is in no way reflective of the actual distribution of population on our planet. 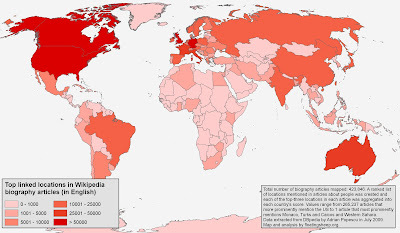 Of course, because the data only includes biography articles in the English version of Wikipedia it is biased towards English speaking countries. This fact helps explain the concentration of articles that reference the US and the UK. 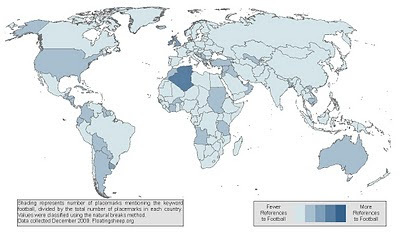 However, language alone does not explain why countries where English is widely used (e.g. India) have a smaller presence than non-English speaking countries in Western Europe. Most importantly, it is clear that Wikipedia has not yet attained its goal of storing the "the sum of all human knowledge." 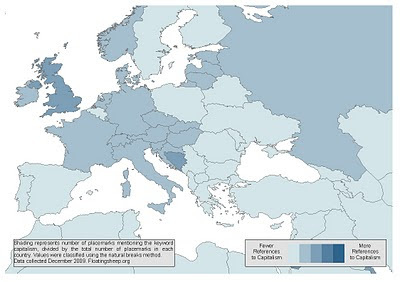 Wikipedia guidelines specify that biographies should only be about notable people and this map suggests that there are more notable people in Europe and North America (at least in the eyes of Wikipedians). Not to knock our home continents but it seems likely (especially after looking at some of the people deemed "notable") that Wikipedia is simply reflecting its user base who are disproportionally from these places. In any case it shows that there are likely still a lot of possibilities out there for new Wikipedia articles (despite claims that Wikipedians are running out of new topics to write about). And in the big picture it again raises questions about who participates in online discussions and what is discussed and documented in these conversations. The data used to create these maps were collected by Adrian Popescu and are available here for anyone interested in playing with them. The data were actually collected through a rather complicated process that we'll explain below. First of all, we need to define biography articles; basically, any article about a person in Wikipedia (e.g. Angela Merkel, Ron Jeremy or Gary Brolsma). A list of biographies was created using data harvested from the list of occupations. We then geolocated each biography article. This was done counting the number of references to place names in each person's biography and then mapping only the most mentioned place in each article. 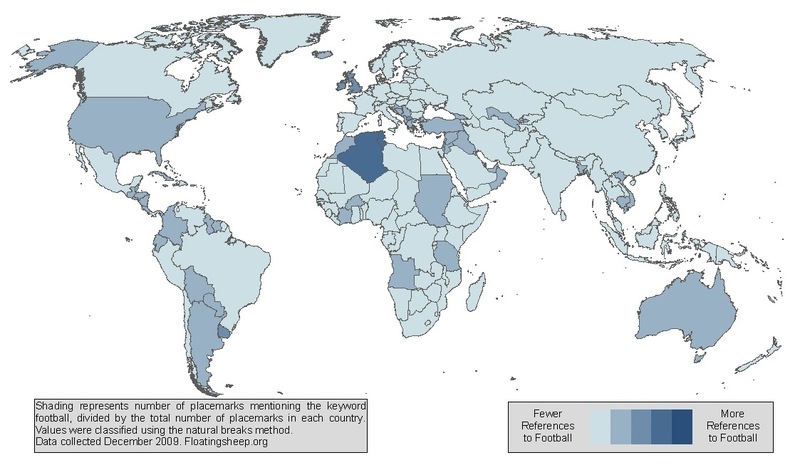 Ranking of placenames was conducted not only using the English version of the article, but also using the equivalent in up to seven languages (English, German, French, Dutch, Spanish, Italian and Portuguese). The thinking behind this method of ranking is simple: the more article versions mention a given location, the more relevant for the concept that location is. We have, however, also done some analysis with the 2nd, 3rd etc. most mentioned places in each article and will be publishing a post on this work soon (along with analysis of Wikipedia data by century and the geography of specific occupations (e.g. artists, politicians and footballers) within the encyclopaedia). It is clear that this method favors European locations at the expense of places in the rest of the world. Japanese and Arabic Wikipedias, for example, probably have a very different geography (something we are also working on mapping). The fact remains though, that the English language Wikipedia offers us a very particular worldview rather than access to "the sum of all human knowledge" (for the time being at least). Hmmm....that reminds us, we should start up a Floatingsheep page at Wikipedia some time soon. ...and some of our previous work on mapping Wikipedia here. The article below is focused on the role of search engines (particularly Google) in ranking and sorting the Internet; a critical "black box" of our experience on the Internet which determines what we see and what we miss. If this link doesn't work for you, email me for a copy. Zook, M. and M. Graham. (2007). The Creative Reconstruction of the Internet. GeoForum. Vol. 38(6). 1322-1343. Abstract: The Internet has often been portrayed as the ultimate leveler of information where existing hierarchies of power and privilege are undermined by meritocracy. Some websites and functions are, however, more equal than others. In particular, search engines such as Google have been a key means to construct meaning out of disorder. The recent incorporation of spatial elements into the Google indexing raises fresh and geographically relevant concerns. 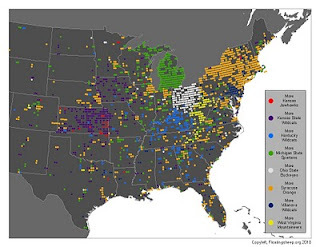 This article focuses on the construction, access and use of Google derived rankings to deploy geo-referenced information in the physical environment and the way this melding of code and place affects how people interact with place. 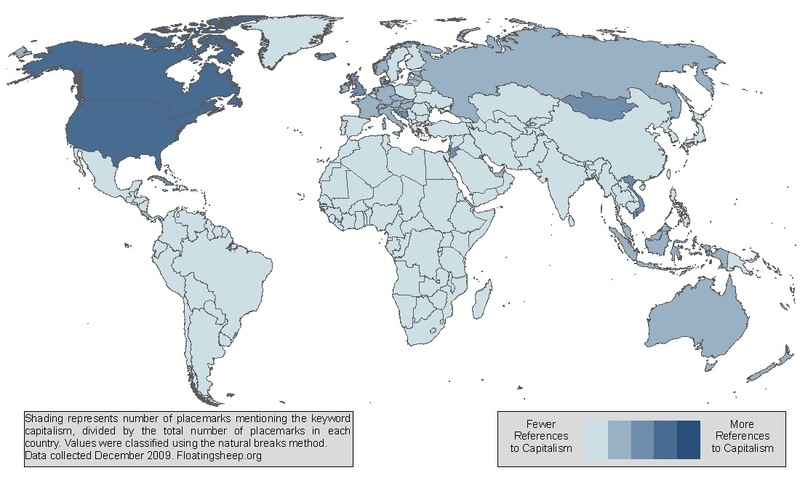 Using the theoretical concept of DigiPlace this article analyzes how Google Maps and Google Earth are structured and shape what appears (and what does not) in cyberspace and DigiPlace.